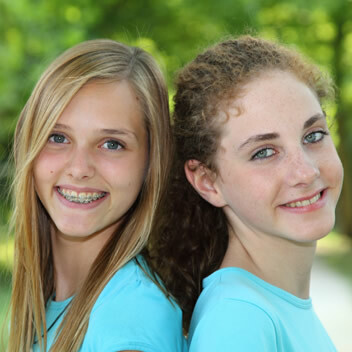 With braces on your teeth, it is more difficult to keep them clean. Regular brushing and flossing after every meal and snack is essential to keep the teeth healthy throughtout the orthodontic process. We recommend using a mechanical toothbrush such as the Sonicare to help keep your teeth and braces squeaky clean. After every meal, brush your teeth for two minutes with fluoride toothpaste and either a soft and small-headed toothbrush or a powered brush like the Sonicare. Brush above the braces, directly on the braces, and below the braces using small circular motions. Pay special attention to the area above the braces on the top teeth next to the gum line and below the braces on the bottom teeth next to the gum line. Also, brush the inside and chewing surfaces of the teeth like you normally do. To help keep your teeth healthy and prevent cavities, it's important to floss after every meal. To floss with braces, you have to either use a floss threader, Super Floss, or a special orthodontic flossing tool like the Platypus Flosser to get under the wire. Get a long piece of floss, wrap the ends around your pointer fingers of both hands, leaving a few inches of tight floss between them. Slide the floss gently between two teeth and pop it through the contact area, then slide the floss up and down on the side of each tooth beneath the gum line. Repeat this through each contact area until you have cleaned between all of your teeth. In addition to flossing, you might even try a Water-Pik for even better cleaning.